For the mere mortal, counting the number of CPU coolers on the Computex show floor would be a grand challenge, but finding thermoelectric coolers is much easier. 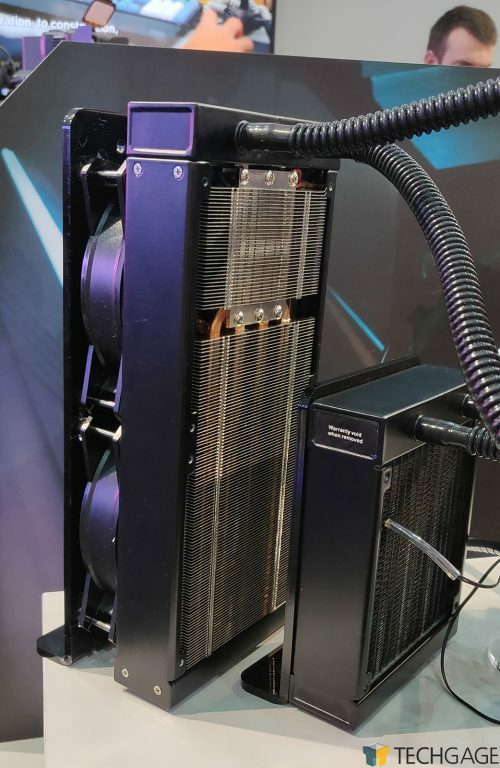 While visiting Cooler Master, company reps were eager to show off its upcoming TEC cooler, which at the current time doesn’t seem to have an official product name – but that’s OK, since it’s not going to be available right away. Thermoelectric coolers use the same kind of technology as your refrigerator to keep temperatures below the room ambient. That means that if a CPU effectively has no load, it could quite literally run cooler than the outside temperature, which of course means a CPU would run at a much lower temperature than a typical liquid cooler with only a radiator. After running liquid through the TEC, it’s then passed on to the radiator which sends it to the block to pass over the chip. Currently, the radiator is 120mm in size, but the company hasn’t ruled out larger sizes in the future. 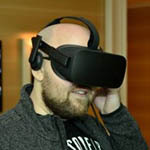 I asked about whether or not GPUs could be added into the mix in the future, and the company said initial models wouldn’t likely support that, but it’s something it will consider. As you can see in the above shot, the temperature reading seen on the show floor was about 20°C, which, as hard as it is to believe, was probably below ambient (sweating while at Computex is a given). The company told me that this cooler could be priced at around $300, but that is by no means written in stone, as improvements could bring costs down. Even if it dropped $50, though, $250 is an expensive cooler, but when compared to robust DIY water-cooled setups, it’s attractive for an AIO design – one that’s not at all complicated to use (and presumably, install). This TEC is going to feature the full complement of features Cooler Master puts on its other higher-end AIOs, including RGB for the pump and fans, a “mirage” lighting effect on the impeller, and almost certainly software support. While the pump in the picture is silver, the end result is going to be black, which really shows off that mirage RGB effect well. Like many things at Computex, this TEC is a ways off from release, but that’s a good thing since refinements need to be made to make sure it’s commercial-ready. We can’t wait for that, and ideas on temperatures with real CPUs.